The Timber Hawk Spike Pack is made for mobility. Its slim, form-fitting profile lets hunters crawl through bramble and brush without snags, and the streamlined design allows for fast-and-light travel in the field. 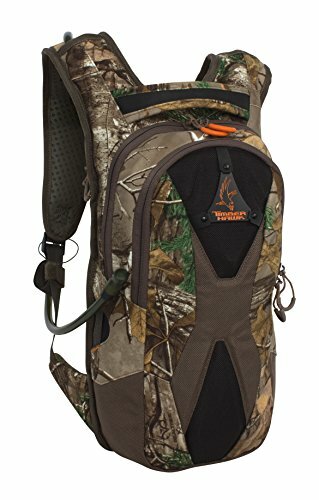 Storage within the pack is designed to keep gear easily accessible so you can stay focused on the hunt, not searching for your gear. The included two-liter Hydrapak reservoir allows for hands-free hydration, and it’s reversible for easy cleaning at home. The front pocket features a compartment for medium-size items such as a GPS or flashlight, and a zippered mesh pocket where smaller items can be stored and quickly retrieved. It also includes the Hawkeye Bino System, which allows hunters to keep their optics on them at all times. The Hawkeye attaches to shoulder straps for effortless glassing, then detaches for use on its own. The bag’s design is full of thoughtful details despite its small size: the zipper pulls are oversized for easy use with gloved hands, and the sternum strap buckle has an emergency whistle. High-density breathable foam pads the back and shoulders for comfort. If you have any questions about this product by Timber Hawk, contact us by completing and submitting the form below. If you are looking for a specif part number, please include it with your message.